What do different body fat percentages look like on different people? Many members of the community have asked questions and expressed concerns about the accuracy of our body fat – and for good reason! Body fat is notoriously difficult to measure, especially given the extreme variability of body shapes, body sizes, and fat vs. muscle distributions. Furthermore, body fat is very sensitive. I’ve personally come away from many DXA scans despondent about the number I received, even though I know that I am healthy and fit. It’s really tempting to get angry, frustrated, or dismiss the number as untrue – and sometimes that is certainly the case as body fat is not a perfect or precise science. 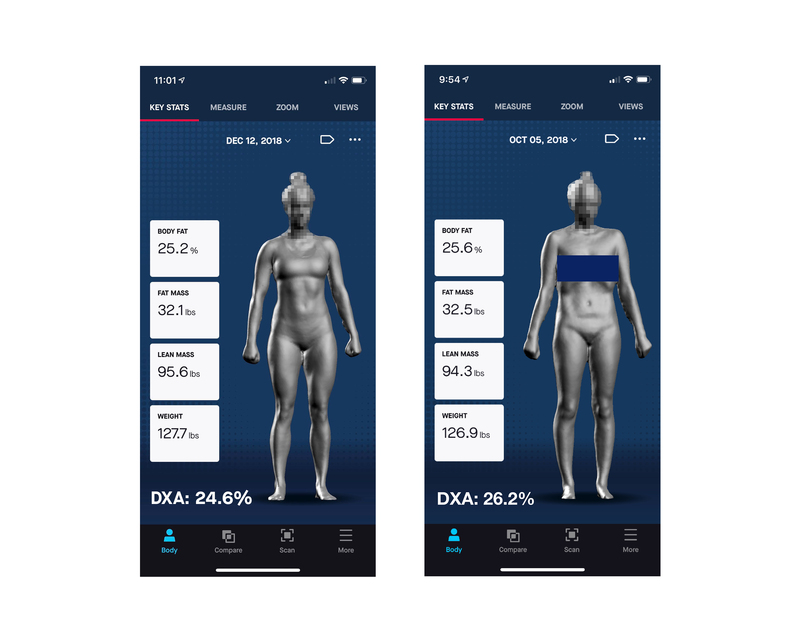 We as a company have learned a great deal over the past three years about bodies, body fat, and how the numbers do and (often) do not mesh with our preconceptions about what bodies at different body fat percentages should look like. We hear your concerns – we’ve had many of the same questions as we’ve been developing and validating Naked. To help get you up to speed on our learnings, I created this blog post to illustrate how different body fat percentages can look on different people. Although this logic stands for men and women alike, given that we’ve received more feedback about scans of females, we’re going to tackle women first! 1. Every single body is unique. Take a minute to think about this: literally no two bodies are the same. Even identical twins are different! Bodies come in hugely different shapes, sizes, colors, and packages. We’ve seen this first hand as we’ve scanned thousands of people. Our uniqueness is a wonderful part of being a human but also makes it incredibly challenging to quantify health or fitness in a way that conveys a singular meaning for all people. While it’s tempting to compare your body and body fat percentage to your best friend, sibling, or training partner, it’s important to remember that you can really only compare you to yourself. 2. Women (and men!) with the same body fat percentage can look wildly different! Just because two people both receive a 25% body fat reading on Naked or DXA (or any method, for that matter!) doesn’t mean their bodies look the same – or should! Their weight may be drastically different, they may weigh the same but distribute fat differently, they could be very muscular with fat, or very lean with little fat. This is why googling “what does 25% body fat look like” can be so misleading! It’s just not that simple – there’s no one way a person at a single body fat looks. And this doesn’t even account for the fact that google images (like the one below) aren’t clear on how they calculate body fat – I’d be willing to bet it’s not using a clinically validated method like DXA. 3. It is possible to be very fit at many different body fat percentages. All of the women in the images below exercise. Many of them exercise 5+ times a week. These women are runners, triathletes, tennis players, weight lifters, dancers, and more. Many of them have visible abs. The bottom line? Being fit, or thin, or having a flat stomach, or even a thigh gap does not mean your body fat percentage will be under 20, under 25, or even under 30. 4. Different methods will yield different (and sometimes wildly different!) numbers. As we’ve written a whole series on this topic, I won’t go too much into depth here – but remember that body fat is an estimation. Each method (DXA, dunk tank, Naked, bioimpedance, calipers) is derived from another method and is subject to a wide variety of error sources. Calipers and bioimpedance scales found in the home nearly always underestimate clinically-used methods such as DXA and dunk tank. Furthermore, methods may be better suited for some body types than others – DXA, for example, tends to overestimate elite athletes and underestimate obese individuals, while Naked tends to overestimate curvier women compared to DXA. Each method is continually working to mitigate these inconsistencies, but it is a considerable challenge. Thus, we emphasize the importance of picking a single method and sticking with it. This will ensure that you are able to best measure change over time in a valid way. 5. Medical definitions of healthy body fat may need rethinking, especially for women. Body fat, like weight, is a proxy for rather than a direct measurement of health. Taking a broader view, body mass index (a metric that divides weight in kilograms by height in squared meters) on the population level is great for predicting cardiovascular disease, but is awful at the individual level. Body fat is better than weight or BMI at the individual level, but still only captures one small piece of body health. Literature shows more and more that body shape, proportions of fat distribution from region to region, and visceral fat levels are better indicators of health than body fat alone. This means that we might want to either redefine the ranges for healthy body fat, or conjure a new and more powerful method to classify body health for the individual. Note: this post includes a small sample of people who have expressly granted their permission to have their scans and DXA values shared. If you’re interested in having a scan shared in this post, please let us know! 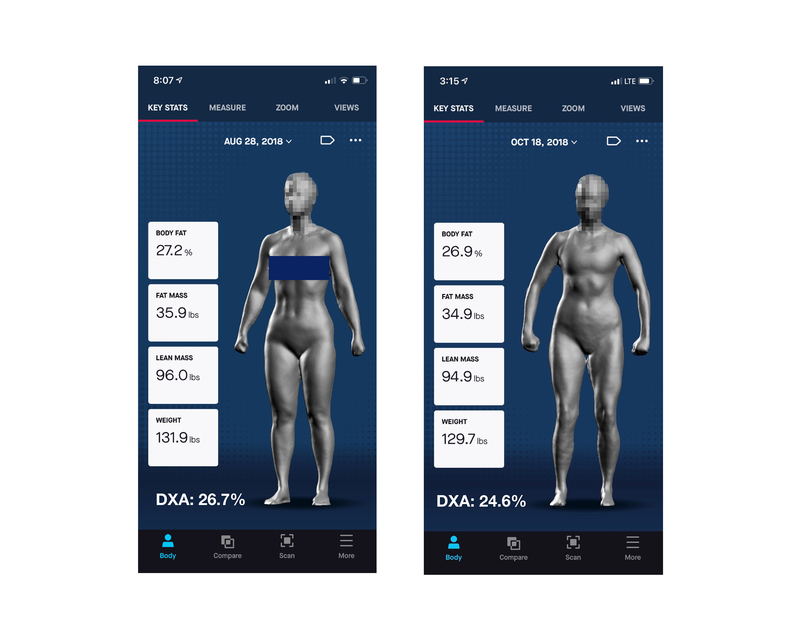 These two women are approximately the same weight, with slightly different DXAs, and very similar body fat percentages as provided by Naked. 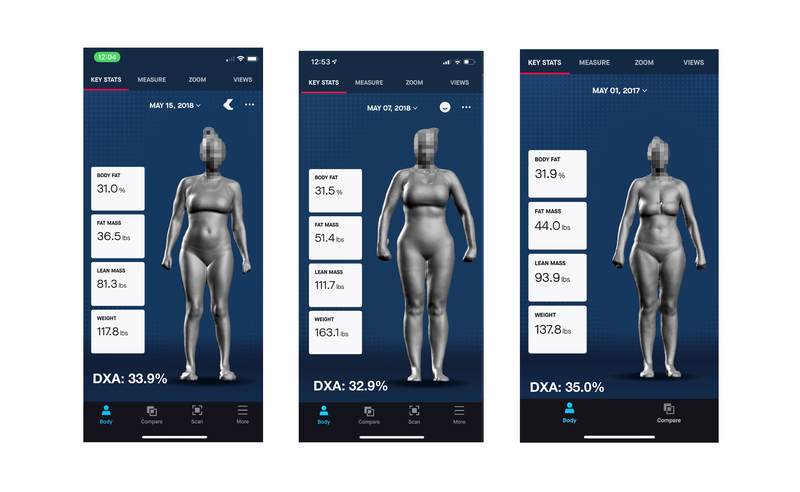 As you can see, despite the similarities in metrics, their body shapes are quite different, reflecting their difference in training methods -- with the woman on the left participating in more strength training and the woman on the right focusing more on cardiovascular endurance. Like the two women above, these two have very similar weights and body fat percentages. They both have visible abdominal muscles, but their muscle and fat distributions are rather different. The woman on the left is a weightlifter, while the one on the right is a triathlete. These two women have the same body fat percentage, but almost a 25 lb difference. Both are athletes (actually, both are competitive tennis players!) with visibly strong core strength! These three women are all regular exercisers with similar body fat percentages despite drastically different weights and distributions of fat and lean mass.